Estimates were derived using field-based measurements and a RandomForest model which correlated Geoscience Laser Altimeter System (GLAS) LiDAR data, Landsat 7 Enhanced Thematic Plus (ETM+) satellite imagery, reflectance, elevation, and biophysical variables. A separate RandomForest model was trained for each continent using a stratified sampling design of roughly 13,000 GLAS-based biomass estimates for each model. There are three data files in GeoTIFF (.tif) format with this data set. Estimates were derived from ground-based measurements of forest biomass density and co-located Geoscience Laser Altimeter System (GLAS) LiDAR waveform metrics to estimate the biomass density of more than 40,000 GLAS footprints throughout the tropics. Then, using RandomForest models, the GLAS-derived estimates of biomass density were correlated to spatially continuous data sets including Landsat 7 ETM+ satellite imagery and products (e.g.reflectance), elevation, and biophysical variables. A separate RandomForest model was trained for each continent using a stratified sampling design of roughly 13,000 GLAS-based biomass estimates for each model (Zarin et al., 2016). There are three files in GeoTIFF (.tif) format with this data set. The pixel values are estimates of aboveground live biomass in the year 2000, in units of Mg biomass per hectare. The following spatial properties are common to all three files. The following spatial properties are unique to each file. From these estimates, average annual carbon emissions from tropical deforestation can be derived as discussed in Zarin et al. (2016). Uncertainty was analyzed for the underlying data products used in this analysis (Zarin et al., 2016). RandomForest models were used to estimate aboveground live biomass in areas where deforestation had occurred within the period 2000 through 2012. The input data included ground-based data, Landsat 7, deforestation data sets, GLAS LiDAR, Normalized Difference Vegetation Index (NDVI), and the Normalized Difference Infrared Index (NDII), and biophysical predictor variables (Zarin et al., 2016). The deforested areas for the period 2000 through 2012 were determined from the Hansen et al. (2013) data set which provides annual deforestation data derived from satellite imagery. Additional national-level deforestation data were obtained for countries where gross deforestation had occurred, including: Brazil, Indonesia, Democratic Republic of the Congo (DRC), Malaysia, Colombia, Ecuador, Guyana, and Mexico (Zarin et al., 2016). The ground-based measurements of tree stem diameter at breast height (DBH of all living trees greater than or equal to 5 cm (Baccini et al., 2012) ) were collected as part of a large-scale field campaign throughout the tropics. The measurements were collected within 40-m by 40-m square plots centered within GLAS LiDAR footprints (circular footprints with 70-m diameter) and converted to biomass estimates using allometric equations from Chave et al. (2005). By linking estimates of ground-based biomass density estimates with co-located GLAS LiDAR data, a multiple regression equation was developed that predicted biomass density based on GLAS LiDAR waveform metrics. This multiple regression equation was then applied to roughly 40,000 GLAS LiDAR footprints across the tropics, yielding an estimate of biomass for each LiDAR footprint (Zarin et al., 2016). Statistical models were developed that related the GLAS-based biomass estimates to Landsat imagery reflectance in the red band, near-infrared band, and two shortwave-infrared bands (corresponding to bands 3, 4, 5, and 7), the Normalized Difference Vegetation Index (NDVI), and the Normalized Difference Infrared Index (NDII), and also to the percent of tree canopy cover from the Global Forest Change data set (Hansen et al., 2013). Additional data sets used as predictors in the RandomForest models included 3-arc second SRTM elevation data and gridded biophysical data at 1-km resolution resampled at 30 meters to match with the reflectance data (Hijmans et al. 2005). Among the biophysical predictor variables, continental models used precipitation, maximum temperature, temperature seasonality, the minimum temperature of the coldest month, the temperature annual range, annual precipitation, precipitation of the driest quarter, and precipitation of the coldest quarter (Zarin et al., 2016). A separate RandomForest model was trained for each continent - tropical America, Africa, and Asia - using a stratified sampling design of roughly 13,000 GLAS-based biomass estimates for each model (Zarin et al., 2016). This work yielded a wall-to-wall 30-m resolution map of aboveground woody biomass density across the tropics. See Baccini et al., (2015) for access to this map. These continent-wide 30-m resolution maps allow for the co-location of biomass estimates with Hansen et al. (2013, v1.0) and the additional national tree cover loss/deforestation data. The areas of deforestation for the period 2000 through 2012 were subset from the continental maps. The results are estimates of pre-deforestation aboveground live woody biomass for the year 2000, in units of Mg biomass per hectare, for these areas. Baccini, A., S. J. Goetz, W.S. Walker, N.T. Laporte, M. Sun, D. Sulla-Menashe, J. Hackler, P.S.A. Beck, R. Dubayah, M.A. Friedl, S. Samanta and R.A. Houghton. 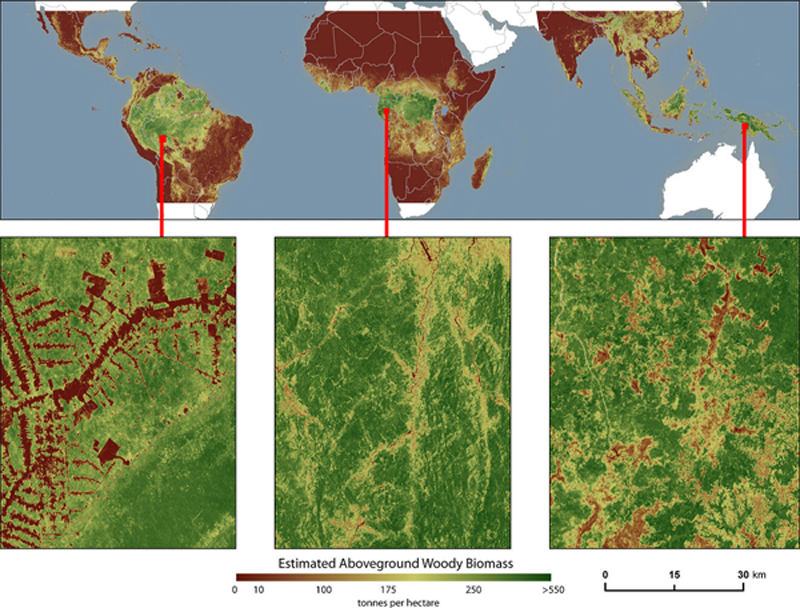 Estimated carbon dioxide emissions from tropical deforestation improved by carbon-density maps. Nature Clim. Change 2, 182–185 (2012). URL http://dx.doi.org/10.1038/nclimate1354.